Price is per 16-inch strand of these beautiful polished beads - each cube measures 6mm. Another stone from the quartz family, usually bright orange to reddish orange, and is translucent to clear. Carnelian is for confidence. Said to help blood disorders and eliminate toxins from the body. Carnelian is in tune with the energies of the Earth, making you feel anchored and comfortable with your environment. Allowing you to pause and reflect, while feeling settled and more secure. 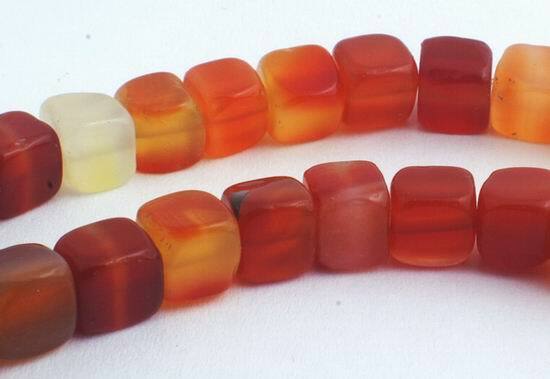 Carnelian also stimulates energy that influences the reproductive organs; hence its long use as a fertility symbol. It is said to stimulate creativity and have a clearing effect, replacing negative energy with positive. Making it easier to find direction and feel in control of your life. A good stone for people starting new projects or who feel they are going nowhere. It motivates, allowing you to find the energy to make the most out of life.